Seven months later, the feature is finally available to try. It comes as part of Build 10763, which was released today to the Insider Fast ring for testers who aren’t afraid of running into bugs. You access the Timeline the same as Task View (such as Win+Tab). By default timeline shows various snapshots of the apps you were using at a particular time, including an annotated scrollbar to help you find your way. You can also tap on a ‘See all’ button to check out everything you were working on in a given day – or you can just use the search bar. 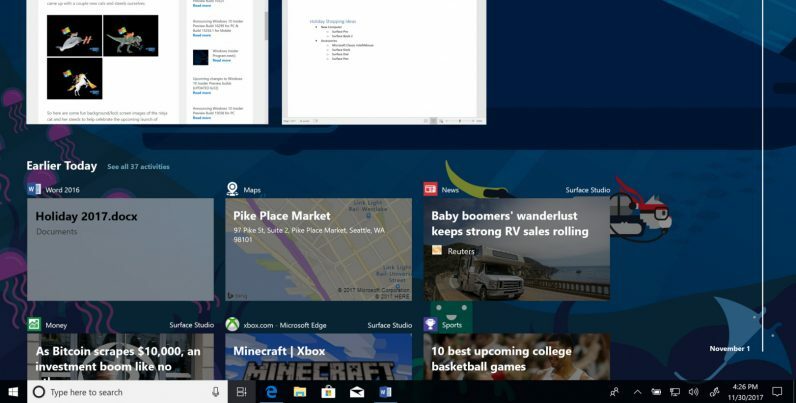 The feature even connects to your mobile devices if you’re using one of Microsoft’s apps like Cortana or the new Edge mobile browser. But if you’d like some more privacy, you can turn off Microsoft’s activity collection in settings. This build includes a ton of other updates, including a sleeker dark theme for Edge, an improved Cortana Notebook, a split touch keyboard, and greater use of Microsoft’s new Fluent design principles throughout the OS. Most notably, Sets, a feature that will add browser-like tabs to any app, is being released in a limited trial with this build. Unfortunately, that means not all Insiders will be able to test them right now, even if they’re running the newest build. As always, Insider builds should be installed with a healthy dose of caution, but to read more, head over to Microsoft’s post below.